Directed by Guy Ritchie and written by John August, the film is played by Will Smith in the role of the Genius with the power to grant three wishes for anyone who comes into possession of his magic lamp. 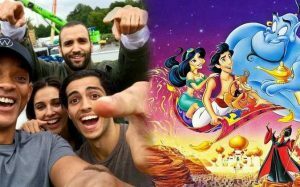 Mena Massoud is Aladdin, the unfortunate but adorable street boy in love with the beautiful daughter of the Sultan, Princess Jasmine, played by Naomi Scott, who wants to freely choose how to live her life. Marwan Kenzari is Jafar, an evil wizard who devises a diabolical plan to remove the Sultan and reign over Agrabah while Navid Negahban plays the Sultan, the ruler of Agrabah, impatient to find a husband suitable for his daughter Jasmine.